Bracelet 8″ long. Available in Five Colors. Shown in New Pastel (left) & Cool. Bracelet 7 1/2″ long. Shown in Bright (left) & New Cool. 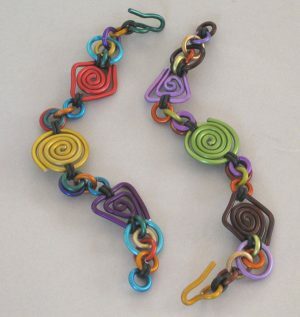 Bracelet 8 1/4″ long, 20 color combinations. Shown in Sylvi’s colors (left) & Norwegian Night. 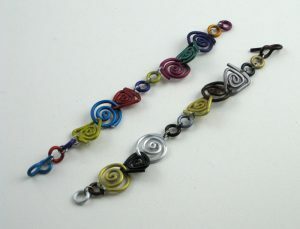 Bracelet fits up to 8″, alternating wire shapes, loops and discs. Shown in Josephine (top), Norwegian Night (mid) & Aberdeen. 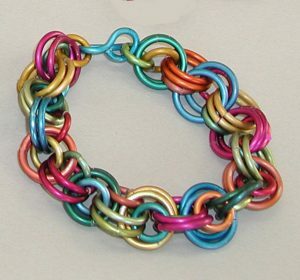 Link bracelet that fist up to an 8” wrist. 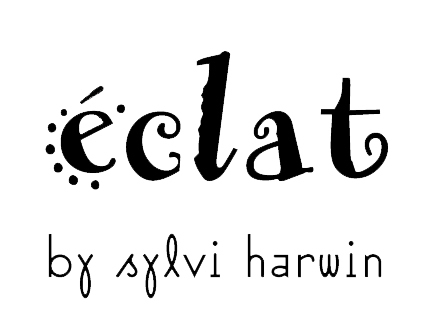 Shown in Krakatoa (top) & Basic. 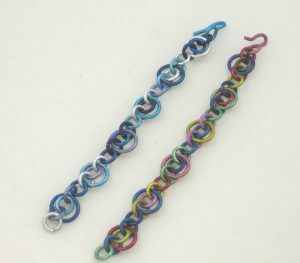 Bracelet in two sizes with intertwined rings, 8 1/2″ long. Shown in Hawaii. Multi loop bracelet 7 ¾” long based upon OCC4 necklace. Shown in Artic (top) & Aberdeen.